I’d promised my son a laptop on his eighth birthday. He already had a 7″ Kindle Fire and a Dell netbook (small again), and he needed a bigger screen. With so many different types of computers available in the market these days, it’s really hard to make a decision and not regret it later. But I had to, and here’s what I did. The screen size, processor speed, RAM, operating system, touchscreen, keyboard, and all other specifications depend on how the computer was going to be used, so I created some use cases first. It was important to establish who was going to use the computer, what their skill level was, when and where they were going to use it, and so on. Based on my son’s previous usage of his laptop and tablet, I figured out that he needs a tablet 80% of the time to play games, watch YouTube and Netflix, and read some Web sites. It was easier to use a tablet for all these activities. He sometimes used Xtramath.org, which his class teacher required to build addition and subtraction fluency. Xtramath required a keyboard. Looking at the future, he would need a keyboard to write papers and create presentations or might need MS Excel too. He would use the computer anywhere in the house – on the dining table, study table, or his bed so it needed to be lightweight. 6-10 hours of life between battery charges would be good. He should also be able to take the computer to vacations though using one in the car is not allowed. The computer should be able to withstand a decent amount of shock due to rough handling. And I’m going to use it too so it should support multiple user accounts. Based on all the considerations, I decided that a touchscreen laptop would not be an ideal computer because of the weight and the difficulty of using the touchscreen by extending the arm. So I decided to compare the laptop-tablet “hybrid” computers that Microsoft is trying to promote with Windows 8. My research led me to Lenovo IdeaPad Yoga, Samsung Ativ, Dell XPS, and Asus Vivotab. Lenovo had a 360 degrees screen rotation mechanism that put the keyboard at the bottom when used in the tablet mode, which was weird and heavy too. Samsung and Asus came with detachable screen but didn’t come pre-packaged with MS Office, which would put the total cost to about $1250. The benefit was the screen size of 13.3″ but it was just too costly for a kid’s computer. I wanted a bigger screen but finally bought a Microsoft Surface, which is a tablet with an innovative cover that also works as a keyboard. The good part was that the keyboard ($129) was available for free. Surface cost me $530, less than half the amount of the other options. The only thing I had to compromise on was the small screen size of 11.6″. And it comes pre-packaged with MS Office. 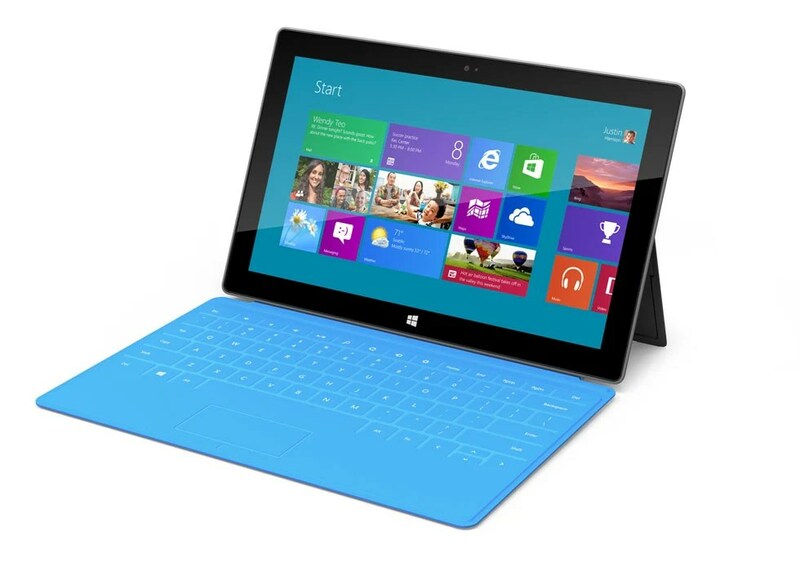 Before buying the Surface, I considered the iPad too. It’s a great computer – super fast, elegant, and the app store is full of apps. However, we don’t need a million apps. The iPad doesn’t interact with our Xbox, and the addition of a keyboard is very clunky and un-elegant. Moreover, there are features in Windows 8 that I really like, such as using two apps side-by-side and the handy search and share features. I understand that I might have made a mistake going with a first-generation device from a software company (they do make Xbox hardware). However, my previous experience switching from an iPhone to a Windows phone has been wonderful, and I hope my experience with the Surface is a similar one. When I was in school and college in the later part of the twentieth century, personal computers had not taken off. In college, we had mainframe computers that didn’t interest me. The only piece of electronic technology we used for studies in college was a handheld calculator. In school, not even that, because we had logarithmic tables! Then I started working and became one of the first few people in my office to have a cellphone. It was expensive but … I was an early adopter! I worked the whole day in the office on a Windows desktop and was quite comfortable using it for completing my work and researching information. There were still no touchscreen phones or tablets. Things changed in 2007 when Apple introduced the iPhone. The touchscreen became ubiquitous on all kinds of devices as they became easier to use and cheaper too. Marc Prensky had coined the term “Digital Natives” in his 2001 essay Digital Natives, Digital Immigrants to refer to the children who are born in a world of digital technology and get to use the digital devices since a young age and are very comfortable with technology. This is in contrast to the relatively older people who learn to use technology and may not be as comfortable with it who Marc Prensky called Digital Immigrants. The children today use laptops, tablets, smartphones, video game consoles, and other devices day in and day out. Does living in a digital and hyper-connected world help them learn how to use technology to “learn”? Surprisingly, it turns out that the digital natives may not necessarily know how to research and find information on the Internet, create a compelling presentation, solve a problem, or think and analyze critically as the research conducted by Richard Arum and Josipa Roksa indicate. Some people say that the traditional way of instruction doesn’t engage the digital natives. Is that true? I don’t think so. Technology and multitasking have shortened their attention spans, which further hinder learning. Technology is a great enabler but just using it doesn’t make someone smart and literate by default. Traditional models of education, when integrated with technology is the best solution. The skills required to succeed in today’s world still need to be developed and the digital immigrants may be the right people to help the natives. Many adults are very comfortable with technology and are skilled in achieving their goals using technology.